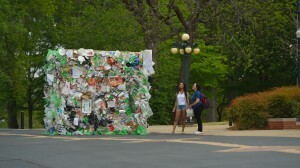 2014’s Green Week included a ‘trash cube’ on campus to spark awareness of recycling. OXFORD, Miss. 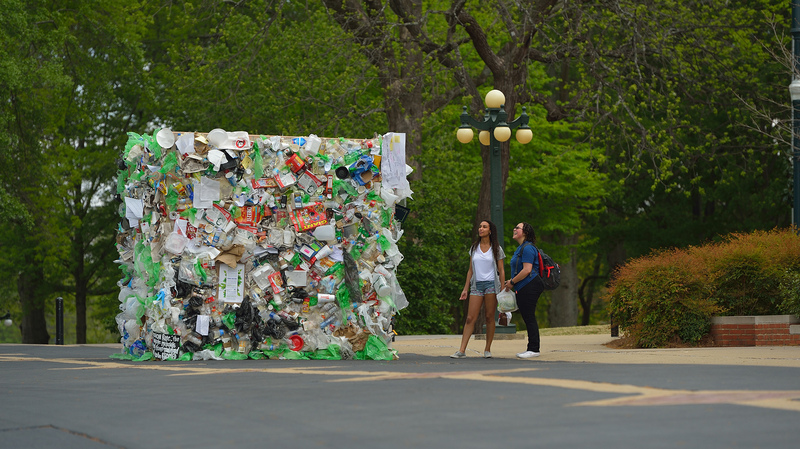 – The University of Mississippi will observe Green Week April 21-24 with the goal of raising awareness on campus and in the community about the importance of environmental sustainability. West, a professor of anthropology at Columbia University’s Barnard College, will deliver the Earth Day keynote address at 7 p.m. Wednesday (April 22) in the Overby Center. She plans to discuss the impact of current and future climate changes on the people of New Guinea and the Pacific islands. Green Week events kick off at 10 a.m. Tuesday (April 21) with a 30-minute walk along a portion of the Ole Miss Tree Trail guided by Nathan Lazinsky, a certified arborist from Landscape Services. At 7 p.m., the Honors College Student Union will host a screening of the film “GMO! OMG!” as part of its Progressive Film Series. The annual Sustainability Fair takes place on the Student Union Plaza from 10 a.m. to 2 p.m. Wednesday (April 22). It features interactive displays from campus and community groups, an on-campus farmers market and more. Participants will receive tickets, which can be redeemed for prizes, for visiting each table. Other Green Week activities include Pedal and Picnic, a group bike ride followed by a free lunch courtesy of Freshii and Ole Miss Dining, and the EcoGala Art Show, a sophisticated and sustainable showing of student artwork. Registration is required for Pedal and Picnic. Email green@olemiss.edu to reserve a spot. Green Week will conclude on Arbor Day (April 24) with a tree planting celebration in the Circle led by Jeff McManus, UM landscape services director. Attendees will receive free Ole Miss seedlings that were transplanted from the Circle earlier this year, while supplies last. All Green Week events are free and open to the public. For more information about Green Week, visit http://greenweek.olemiss.edu or email green@olemiss.edu. 11 a.m.-noon – Pedal and Picnic, group bike ride and free lunch from Freshii. Registration required. Email green@olemiss.edu to reserve your spot.